Jose has over 20 years of experience in the software development and IT management space. Prior to Prevedere, he was CTO of Rumba Solutions, in charge of architecture and platform solutions for client applications. Previously, Jose held development roles at JP Morgan Chase, HMB, and the Ohio Department of Health. Jose has a Bachelor of Technology degree from the University of Kerala, India. 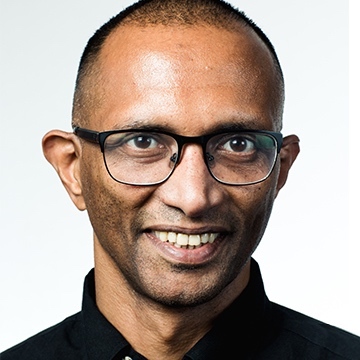 Dinesh is a Committer on the Apache Cassandra project and has been a professional Software Engineer for over a decade building highly scalable realtime Web Services and Distributed Streaming Data Processing Architectures serving over 1 billion devices. He has a Masters degree in Computer Science (Distributed Systems & Databases) from Georgia Tech, Atlanta, USA. Rajnish Kelkar has 33 years of experience in international management and operational roles in Oil, Gas, Energy and Maritime industries. Rajnish is a Chartered Engineer, a Member of the Institution of Engineers and the Institute of Marine Engineering, Science and Technology (IMarEST-UK). He holds a Bachelor‚Äôs in Economics and a MBA from Henley Business School, UK. Gleb has more than 15 years experience leading product design, from strategy to visual execution, across physical and digital product, mobile, web, augmented reality, and installations, as well as TV, home automation, and transportation ecosystems. He is particularly passionate about his latest work with various artificial intelligence start-ups. With more than 38 years of experience in the plumbing industry, Paul brings extensive knowledge to his role as senior manager front end innovation and regulatory at Delta Faucet Company. In this role, his responsibilities include anticipating product needs for the Delta®, Brizo® and Peerless® brands, identifying innovative technologies and product enhancements, and collaborating with industrial design and engineering teams. As a voice of the customer, he ensures products brought to market offer relevant innovations for end-users. Products developed under his guidance have received numerous prominent industry awards including ADEX and Stevie awards and he holds six patents for plumbing products. He also actively interacts and works to influence legislation for federal, state and 40,000+ local jurisdictions. He has been instrumental in working with these organizations in the area of water conservation and always brings in the voice of the customer. Paul has worked closely with the EPA, WaterSense program and has helped to develop several different standards for the program. Corey Schiff leads CS Beverage Solutions with over 25 years of senior level management experience in the Food and Beverage and CPG Industries. Schiff's expertise is in sales, marketing, business development, research and development, product development and customer service. Schiff's expertise and experience have made him a valued resource to executives in the foodservice, grocery, industrial, c-store, liquor, CPG, distribution, hotels, air lines, restaurant buying groups, and food and beverage manufacturing industries. Sherry specializes in strategic communications programs for fast-growth technology companies. She holds a master's degree in business communication from ESLSCA International Graduate School of Business in Paris and is a member of MENSA. Steve Spiewak is the Director of Marketing for PlumChoice, an Allstate Company. He has over 25 years of marketing experience in the technology industry, including cloud, IoT, storage and identity solutions. A graduate of SNHU and Northeastern University, he enjoys mentoring new candidates entering the field of marketing. Founder / CEO at Gadget Flow Inc, Investor and Marketing Advisor at Qrator Ltd and contributor at Forbes, Inc, HuffPost and American Express Essentials. Sprint Crowdfunding Fund and Crowdreach advisor and speaker. Varun Verma is a Product Marketing Leader & Data Protection Evangelist with 15 years of experience with Global Fortune 500 companies. He brings extensive experience to the information management market, including backup, networking and networked storage concepts and technologies. He holds a Master’s diploma in Human Resources Management, Operations Management, and a Diploma in Instructional Design.